Here's a short look at what Elvis Presley's life and career were like in 1960. You can also find out what else Elvis was up to in 1960 and in all the years of his life. The conventional wisdom about rock and roll in the early Sixties -- as willfully ignorant of messy details as most conventional wisdom is -- writes it off as dead, or rather sleeping, patiently waiting for the four Prince Charmings called the Beatles to come and kiss it back to life. True, Chuck Berry was in jail, Buddy Holly was dead, and Little Richard was in the ministry, but if you want evidence of a real cultural shift you need only look at Elvis' post-Army days: they weren't worthless, but they weren't exactly exciting, either. Like most Southern boys, Presley just went back to his old job when he finished his tour of duty, but most grunts don't have an NBC special with Frank and the rest of the Rat Pack waiting for them, either. Elvis' good-old-boy act may have been his greatest role, but everyone in the world knew better. Still, it had become clear that rock and roll had finally been absorbed into the mainstream; 1960 was the day of sanitized teen idols aping the sounds (if not the mannerisms) of the music's founding fathers. 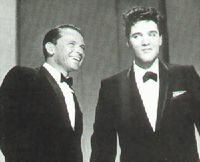 When The King and the Chairman of the Board squared off during that special, Frank swinging "Love Me Tender" and Elvis injecting a dark danger into "Witchcraft," it wasn't a standoff or even a goodnatured rivalry -- it was a clear signal to the world that the music business had come to terms with this new mutation, that Elvis was finally, in the stilted words of Ed Sullivan, "a real fine boy." Except that the boy had become a man in the Army, as so many boys do, meeting the love of his life, testing the waters of decadence, finding his place in the outside world. The main difference between Presley and others who'd lost their mothers at a young age was that he could afford to create his own family out of hangers-on, childhood acquaintances, business associates, and the occasional actual blood relative. It wasn't a real family, because it never challenged him, but it would have to do: oddly enough, being the world's biggest celebrity was the only thing Elvis had left. As a result, there are more than a few people who think The King died the minute he stepped off that troop ship, and merely took another seventeen years to fall down; like a lot of conventional wisdom, it's a big lie that nonetheless contains a few seeds of elemental truth.